Building a cyclist friendly community requires a combination of social and physical structures. Like a pyramid, these structures must be built upon a solid foundation, or they will collapse. When the foundation is strong and the layers of the pyramid reinforce each other, they will support a healthy, thriving bicycle culture. This is the foundation upon which a healthy bike culture must be built. It supports all other advocacy efforts, and the lack of it undermines them. Likewise, advocacy efforts must support this foundation, not erode it. It begins with the law—not just the legal definition of bicycles as vehicles, but legal equity and access to the roadway. Laws which restrict cyclists’ use of a travel lane (Far Right and Mandatory Bike Lane/Shoulder/Sidepath laws) must be eliminated. Even with exceptions, these laws carry discriminatory weight and are most often misinterpreted to the detriment of cyclists. Institutional bias also extends to transportation engineers and the standards set for bicycle facilities. Current minimum standards for bike lanes (and even sharrow placement) are harmful to people on bicycles. Coupled with mandatory use laws and social pressure from motorists, they restrict—rather than facilitate—access to the roadway. Current institutional research is equally destructive, concentrating on the “feelings” of novice bicyclists often at the expense of both the operational characteristics of bicycles and the needs of competent bicycle drivers. Correcting institutional bias is the basis for changing the cultural norms — bicycles must be a normal, accepted, respected part of the transportation system (vehicles, not toys). This bias must be corrected with education of law enforcement, planners, engineers and policy-makers. When our culture treats bicycles as vehicles, the average person will think of himself as a driver when on a bicycle, thus be more inclined to obey the rules of the road, seek education and act assertively as an equal user. NOTE: “Respect” is treating bicyclists as equal drivers with the same rights and responsibilities as other drivers. Bicyclists are neither inferior nor superior to other road users. The majority of reported bicycle-related injuries are the result of collisions with fixed objects, other bicycles, pedestrians or falls due to loss of control. Teaching people simple bike handling skills and increasing their confidence with the vehicle will greatly reduce these accident rates. The majority of bike vs motor vehicle crashes are a result of bad choices by cyclists (running stop signs/lights, riding against traffic, on sidewalk, in the dark without lights, hugging the edge of the road, etc.). The crash data indicate that regardless of other safety issues in the traffic environment, uneducated cyclists are too often the cause of their own problems. Law enforcement for dangerous practices like wrong-way riding, riding without lights at night and violating right-of-way should be part of the education process. Poor cyclist behavior feeds the belief that cyclists don’t belong on the roads and fuels animosity toward cyclists. Crash reports feed the incorrect belief that cycling is dangerous and cyclists are vulnerable victims. Fear feeds the behaviors that increase crash risks. the forces wishing to promote cycling do so by promoting education (like the motorcycle industry does). When the public is made to understand how easy it is for bicycle drivers to control their safety and interactions with other road users, we will improve both cycling safety and the attractiveness of cycling. and the effects of hostility. Fear of hostility causes bicyclists to operate in ways that are inimical to their safety. Riding on the sidewalk or squeezing into the gutter to avoid the wrath of motorists contributes to both (solo-fall and bike-v-car) crash types listed in the previous section. Bicycling is relatively safe, educated bicycle driving is even safer, but our traffic culture itself is not a paragon of safety. The evening news gives us constant, if not disproportionate, reminders. Unsafe behavior is on display continually, even as most of us elude the consequences. Improving safety requires changing the way people behave and view their responsibilities as drivers. We need more traffic enforcement, better traffic justice and a greater sense of citizenship and civility. We also need more exposure to laws regarding bicyclists and pedestrians in the driver education and licensing process. Improving the traffic culture will have a positive effect on everyone in the community, not just bicyclists. Facility improvements that benefit all vehicle drivers: maintaining good pavement/repair of pavement hazards. Safety improvements for bicyclists: Replacing parallel grates that catch wheels, fixing longitudinal pavement cracks and bad shoulder seams, addressing steep-angle RR crossings, and upgrading unresponsive traffic signal sensors. Facilities for bicyclists: When behavioral problems affecting safety are addressed, and when the institutional bias against bicycle driving is replaced with respectful understanding of bicycle drivers’ needs, infrastructure can be targeted to solve practical issues of connectivity and access. Intelligent infrastructure solutions are less expensive and less likely to have unintended consequences than facilities that are built in an attempt to bypass education or solve social problems. Land Use Policy and Transit: Better vision for land use really should be a foundational element, but for most of our cities, that ship has sailed—at least for the time being. However, as our growth has stalled, now is a good time to at least look at policies which would promote bicycle permeability through new suburban development. Another global asset to cycling is a complete, integrated transit system. When bicycle transportation is added to bus and rail, they complement each other. Public transit extends the range of the bicycle. The bicycle increases the service area of public transit. A functional public transportation system also makes it easier to keep dangerous drivers off the road. There are opportunities for alternative transportation funding developing at the federal level. Most bike advocates are pushing for money to build facilities without addressing the critical social and education aspects of a healthy bike culture. We need to encourage advocates, community leaders and policy-makers to think bigger and focus on core issues. I found it interesting that LAB chose a speaker from Copenhagen as the keynote for the Bike Summit. It’s easy to get distracted by the cycletracks, but something more fundamental caught my attention. Danes who ride bikes for transportation don’t think of themselves as “cyclists” or “bike commuters”… in the same way Americans who drive cars to work don’t think of themselves as “motorists” or “car commuters.” Directly related to that, Danes can expect the same level of engineering and concern for efficiency, safety and connectivity on their bike facilities as we do on our roads. Bicyclists are also welcome and respected on all roads outside the network of bikeways. Infrastructure did not create that. Respect for the bicycle as a mode of transportation existed first. We aren’t even there yet. I like the pyramid, and the way that you explain how we can’t be successful without starting at the core-base. Everything builds from that, and if you don’t build it soundly, everything on top will eventually crumble down. So let’s do some thinking about how we address the core. It is said that if you only take away ONE thing from a meeting, such as the National Bike Summit, you have done well! Excellent point made in this post. We are bu just sowers in the field. As educated cyclists, and those up and coming, we do our best to ride within the limits of the law and common respect and decency toward our fellow citizens. Cycling has become a new experience to many here in this country within the recent months. The fear of cycling as “not safe” has been ingrained and will be hard pressed to rescind this abomination of notions. My most recent post helped at least one co-worker understand cycling better. Our Ride Buddy/Ride Mentor forum is an excellent tool to use to help educate the general public about the benefits and safety of cycling, whether for recreation, commuting, or small trips around the house. By inviting our fellow citizens to “Ride a Mile in Our Shoes”, and I am pretty sure respect for our use of the roads will begin to come more commonplace. And more cyclist will be on the roads by choice and not need! Thank you for that, Keri. As clear a declaration as I have seen, and vastly clearer than some I have seen lately. Exactly. The ability and likelihood of establishing a culture that respects and honors the cycling alternative begins with creating respect. When will the DOTs of America begin to connect the dots? This looks like a promising prototype for cycling activists to follow. I’d like to know more about how you’d actualize this – what sorts of strategies would you use? What avenues would you go through? I’m working on my own citizen journalist/activist prototype for making Vegas more public transit friendly :). On the law side, it takes a statewide advocacy organization and a long process of working with the legislature to get ride of far right or mandatory use laws. I know some of the advocates who made it happen in PA, and some who are doing it in Ohio. Hopefully we will work toward that here in Florida. On the national level, I know that Amanda Eichstaedt (Board Chair of LAB) has been working with Chairman Oberstar to insert the Equity position into one of the transportation bills. What effect that will have at the state level, I’m not sure, but it can’t hurt. On the education level, I think we need to raise awareness of safe cycling education across the board. 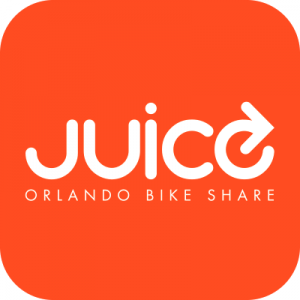 I know that a year and a half ago, very few cyclists in Orlando had even heard of cycling ed, now there is a lot more awareness… and we’re in need of a mechanism to keep a constant offering of classes. Ultimately, a successful program requires an organization that can handle the administration and marketing and provide classroom space. Leaving LCIs on their own to schedule classes, find classroom space, collect fees, order materials, buy liability insurance, etc. basically results in no classes being taught. 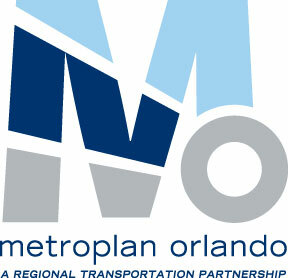 On the motorist-ed level, we are currently pursuing a pilot social-marketing program in Winter Park. The aim is to create a more civil traffic culture. We are currently finishing the research phase and hope to be entering the marketing phase this summer. More on that here. 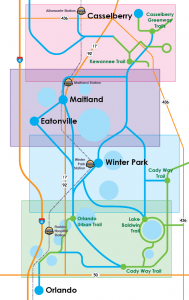 I live in Kissimmee and have a mountain bike that I like to ride over to Celebration. I stay on the sidewalks on route 192 but w/all the tourists, I really have to watch the cars. Florida is just not one of those places where you look for bicycles unfortunately. Jeff, I avoid the tourist areas even in my car, so I can make no claims for what it’s like to ride a bike there. All parts of Florida are not the same. In general, whether people are looking for bicycles or not, they see me just fine. What they do once they see me (pass courteously or be a belligerent a-hole) depends on the driver. And it seems there are more belligerent ones in some regions and more courteous ones in others. If you’re having trouble with people not seeing you on the sidewalk, it might have more to do with being on the sidewalk than with Florida drivers. No matter where in the U.S. you are, sidewalk riding is more conflict-ridden than riding on the road. Where I live, I don’t seem to have the frequent problems with blustery motorist behavior that you report. But I don’t get motorists stopping to bow to me and lay palm fronds in my path either — and I don’t have that as a goal. Normally courteous behavior is all I ask, and it’s what I get. It’s a shame that we even have to talk about respect. I would also suggest that we be careful to avoid using the word ‘respect’ when what we really want is driver awareness of the environment. If there’s a bad bicyclist/motorist encounter because the motorist was inattentive or used poor judgment, the solution is attentiveness and good judgment. Talking about respect in that context just muddies the issue. Again, I’m talking from the standpoint of someone who doesn’t see a huge need for remedial education in civility in my community. Well, a former ED of a well-known advocacy organization also tried to co-opt the word “ethics” as meaning lock-step agreement with her agenda. I’m not letting anyone take away my words because they use them poorly. “Respect” is the right word to use — from institutional to personal treatment of cyclists. The DOTs don’t respect bicycles as vehicles. Their inclination is to get us out of the way. The bike paths built here similarly show disrespect of bicycles as vehicles—terminating into parking lots because we must drive our cars to ride our bikes, or terminating onto sidewalks with no effort to integrate users back into the roadway grid. They aren’t intended to facilitate bicycle transportation, they’re built to give people a place to play with their toys. John, you are personally familiar with the NCUTCD compromises made to have Sharrows added to the MUTCD. Does a compromise to place a Sharrow in the door zone reflect a cultural respect for cyclists as vehicle drivers with an equal right to travel safely on the public way? It costs NOTHING to move that sharrow 2 feet to the left. NOTHING! But to the DOTs who objected, apparently our lives are worth less than nothing. It’s more important to keep us out of the way. When motorists feel entitled to honk and yell at a cyclist while passing, unimpeded, on a 6-lane road, we have a respect problem. When a survey of attitudes reveals that the majority of motorists think it’s dangerous and stupid for cyclists to ride in traffic, regardless of whether or not it’s legal, we have an ignorance problem. When a significant percentage admit they will harass a cyclist because of this belief, we have a respect problem. That is all aside from motorist poor judgment. Poor motorist judgment is the least of my problems. It’s pretty easy for an educated cyclist to overcome. But a culture that thinks of bicycles as toys isn’t going to promote, encourage or respect cyclist education. Respect for cyclists as drivers is the keystone of solving all the other issues. You do more harm to the cycling community than good. 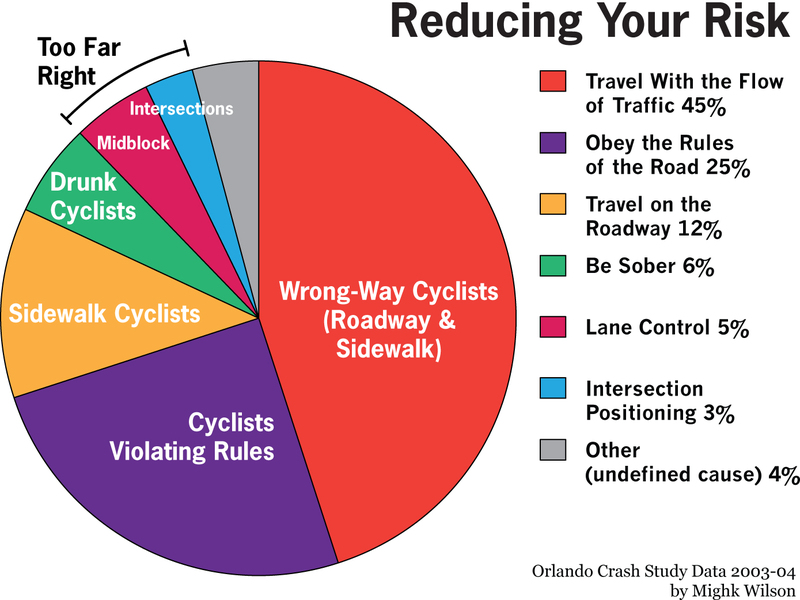 The stats speak for themselves “in Orlando, only 8% of cyclist-injury crashes between cyclists and motorists involve a legally-operating roadway cyclist.” And yet you still whine about motorists, as if they are the cause of majority of crashes. Since when is it “cultures” reponsibility to ” promote, encourage or respect” my education as a cyclist? Scratch that…I dont want to be lumped in with you..Im a triathlete. Your elitist and entitled attitude does nothing to help. Did you even read the article Geo? Do you know anything about the Cycle_Savvy philosophy? I am not sure if you posted in the wrong place by accident or if you are just cruising for a fight. You could not be more off base in referring to Keri as “eliist”, in fact I get more of an elitist vibe from your self proclaimed “triathelete” status. Keri and many of the other members of this site are actually just asking for EQUAL status no more, but no less. They are not hte ones asking for millions of dollars for new infrastructure – they just want the right to use the existing infrastucture free of harrasment by motorists and law enforcement under the mistaken or misrepresented guise of their safety. I am primarily a motorist, but I have learned much from their course, that not only taught me how to use the existing infrastructure in a safe and effective manner as a cyclist, but also as a motorist. I am not necessarily on board with all of the items on their wish list, BUT I have RESPECT for their cause. It is obvious to me that you have not taken the course or you would realize how absurd your claim is that they are “doing more harm than good”. Merry Christmas, and a Happy New Year to you nonetheless. Keith, Thank you for the kind words! I am honored by your support for the CS program and grateful for your readership of this site. Tailwinds and Happy New Year! It is my pleasure Keri. I cannnot help myself from singing the praises of the cyclesavvy course. As you know, I was very skeptical of the course before enrolling, I was certainly not interested in being part of a guerilla like rebellion that demanded the abolishment of motor vehicles, the renunciation of my driver’s license, called for the overthrow of the DMV and mandated comfortable but God awfully unattractive leather footware. Much to my (pleasant) surprise, the CS course is NOTHING like that. It is a well thought out and executed program that nearly perfectly balances just the right combination of classroom material (backed with stunning visual aids), technical skills development, and live on the road demonstration. I would have NEVER contemplated riding my bike through downtown Orlando prior to the course, and now I envy those of you who get to do it on a regular basis. I am not ready to turn in my keys just yet, but I know that if the need, or opportunity, presented itself I could get around town just fine. Even with the occassional A-hole. I think you may be missing Keri’s point, Geo. From my understanding of her philosophy, it is not that motorists need to be more careful around cyclists because motorists cause most of the accidents. It is that motorists need to be more respectful of cyclists using the road in general, including and especially car-centric road configurations and roads lacking obvious bicycle infrastructure such as bike lanes, because the dominant cultural viewpoint that cyclists don’t belong on such roads is partly responsible for many cyclists’ timid and cowering behavior on those roads (or the adjacent sidewalks), and that this behavior keeps those cyclists from asserting themselves adequately to be safe. To be more specific, I would say that motorists must be respectful of those cyclists who are both law-abiding and assertive. I wouldn’t expect them to respect the ones running red lights, riding the wrong way, etc. Unfortunately, few people know what safe and legal cycling looks like. Too many people (motorists AND cyclists, and even some law enforcement officers) believe lane control is unsafe and illegal, when it is neither. What some critics miss is our promotion of “control and release” and other delay-management strategies. They only see the lane control element and believe we don’t care about our impact on motorists. Now that money for frivolous luxuries like bicycle specific infrastructure is drying up, we have an opportunity before us to get our “advocates” started in a new and better direction. Bike racks. I don’t WANT to take my trashmo bike in the store with me. Put in a bike rack and I’ll figure out how to get there, same way as motorists find their way to parking spots. Cities have rules on parking spots for businesses, this is no different, other than it’s a lot cheaper. That’d about use up the peak of the pyramid. The pyramid is a brilliant idea on how the relative positions of culture, education, and engineering should hang together. I hope we can all link to and copy this, Keri, as it puts engineering where it belongs, as a capping stone to a solid foundation rather than as a monument to folly. Thank you, Khal! Please do pass it on. I have a PDF handout of this, too. I’ll send it to you. I would also be interested in pdf handout. Another excellent piece. I especially appreciated the part about integrating cycling with mass transportation. The stubborn, irrational, and passive aggressive behavior of many mass transportation people on this subject is very frustrating.